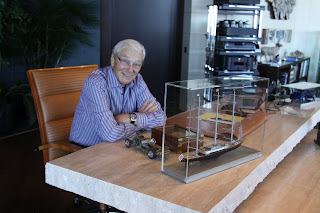 One of the benefits of writing a blog is that not only do I get to pick and choose what I want to write about, I also get to meet and interview people like Tom Perkins, one of America’s most successful businessmen AND most enterprising yachtsmen. The Leukemia Cup Regatta is one of my ‘causes’ and I’m on the committee to help with public relations. As such, I was fortunate to interview Tom at his penthouse apartment on the 60th floor of San Francisco’s Millenium Tower prior to the 2012 Leukemia Cup event held on October 20-21. The wow factor is still with me not just because Tom’s apartment is incredible, with a sensational 180 view of San Francisco Bay, contemporary architecture and design that I appreciate, and decorated with many beautiful and eclectic pieces from his enviable art collection, but also, as I discovered throughout the course of our conversation, because he’s had a lifetime relationship with sailboats and the sport of sailing the extent of which I wasn’t aware. I wrote about Tom in my Marin IJ sailing column* however with its 900-word limit, I barely touched on the stuff that touched me as we chatted. 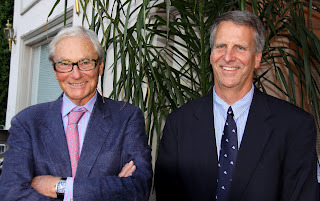 Under Perkin’s leadership, the 2012 Leukemia Cup Regatta, now in its seventh year, raised $850,000. More than 300 guests attended the VIP Dinner on Saturday evening where Gary Jobson took the stage for an informal Q&A with the irreverent Ted Turner, who brought the house down with his tales of four ex-wives and two million bison. 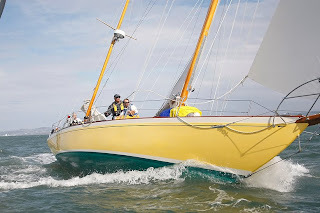 The 2012 First Place Individual Fundraiser Award went to Matt Brooks/Pam Levy owners of Dorade who, with JJ Fetter at the helm, won the Classic Yacht Class division on Sunday. Dorade raised $52,000. The Second Place Individual Fundraiser Award went to Anne Feinberg, crew of Fast Friends, who raised $44,271. The Top Fundraising Boat that won this year’s Leukemia Cup Perpetual Trophy was the Melges 24 Relentless with skippers/top fundraisers David Joyner and Bill Nolan. Relentless raised a total of $58,250. 80+ boats raced Sunday’s regatta. TP: My first experience with sailing was that I had a friend whose parents had a Lightning - racing boats on Long Island Sound - a big class. I crewed for him for a couple of years while I was in high school. I went to Massachusetts Institute of Technology and my big sport there was swimming. I actually held the national - perhaps even the world - record for the 50-yard freestyle - for 14 days (LOL). So, that was my sport but they also had these little sailboats called Tech Dinghies (designed by Hereshoff ), beautiful little wooden boats with a center board and as I recall, a little gaff sail, so I would sail those. I loved to sail. The first boat I actually owned was long after that because I had to work. I went to Harvard business school and I finally came out here (San Francisco) where I bought a little boat called a Teak Lady, there were about 15 of them on the Bay. They were imported and sold very cheaply in those days. Beautiful little boats, not very fast, 17 feet long. That was all I could afford so I raced it and became very good in that class. I never hired anybody to teach me - I just learned from my mistakes. 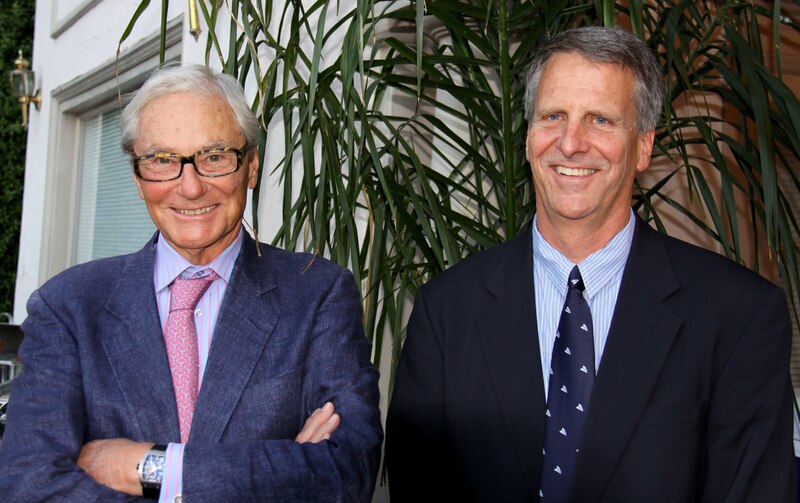 TP: I’m doing venture capital and making money so then I bought Copperhead (still on the Bay which raced in the 2012 Leukemia Cup) - which I own jointly with John Doerr. 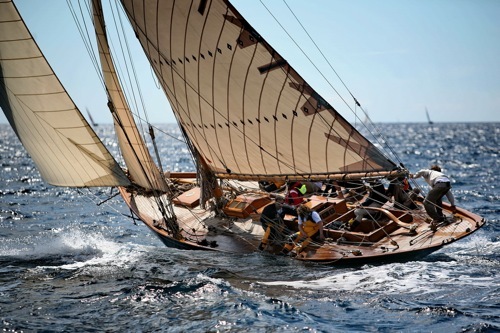 She’s a classic, 47-foot yawl, very rare these days, designed by Philip Rhodes, a very competitive boat. I bought it in Southern California and raced it mostly offshore which we did well with, but offshore racing here is not a lot of fun - it’s so cold and wet. My late wife used to crew with me and said, “No more of this. Why don’t we get a bigger boat that we can entertain our friends on?” Believe it or not, the idea came from her so within nano seconds I’m looking for a big boat and they’re all in Europe of course. I came across Fabio Perini who had just built the world’s first, sort of automated, big boat so you didn’t need as many crew with automated winches etc. I met him and we hit it off very well. Boat building was his hobby, which of course has become a very important hobby now. I became his second customer. He said he had so much trouble with his first customer that if I didn’t come along he was just going to forget it. But, we got along very well and he built me a boat called Andromeda (138 feet). After owning it for a couple of years and using it a lot, he designed a much better boat - faster, more attractive. Although I was very happy with my boat, I sailed into Viareggio (Italy) one day and Fabio didn’t have any English so I had learned Italian along the way. He said, “Cinqo minuto - five minutes!” He wanted to show me the new boat. Five hours later I’d bought a new boat, he took the first one on trade, we called the second one Andromeda La Dea (141 feet). My wife and I had her for many years, we sailed her around the world and raced her. TP: Unfortunately my wife Gerd died after 35 years of marriage (from non-Hodgkins lymphoma) and I became very depressed. I needed a project so I bought a very classic and very famous gaff schooner that needed a lot of work called Mariette (135 feet). I spent a summer restoring it, doing a lot of the work personally. I raced that for ten years. We did very well with that boat and I loved racing a big classic boat - she was 135 feet with her bowsprit and about 108 feet on deck. She was a Hereshoff design and very fast. We had two primary competitors who were essentially the same speed - it was pretty competitive. We were always first or second for 10 years. I found and restored a classic called Atlantide, which was built in 1930 and was essentially a rotting hulk - steel - but still a mess, it couldn't leave the harbor. I basically got the name and the shape and built a completely new boat around that. She was designed by Milne, who was mostly famous for sailboats so she looks like a sailboat. I sold that boat finally this week. TP: I always helmed. I did all the strategy and tactics on my boats. I always have and have never used a professional. It doesn't mean I didn’t have good crew - I didn’t pay them but I wined and dined them. TP: There was a hidden problem which became evermore evident. I was the only one owner who raced his own boat. All the other owners had professional skippers and if they won a regatta they’d get a cash bonus. I was winning so many of them that some ugly things began to happen. The morning of the last race of one regatta, the night before we noticed bubbles underneath the dock. We thought, “strange” - a scuba diver was there, didn’t think anything of it, next morning there was no propeller. Some captain had removed our propeller - it was on the bottom - we had to dive for it and get it but we couldn’t get it back in time to start the race, but fortunately enough wind came up so I just made it to the start line, had a perfect start and won the race. Then these professionals would protest me and not show up at the protest meetings. It took a tremendous amount of fun out of it. And, there was the tragic accident a regatta (off the French coast) where a boat sailed into us - 100% its fault - we were locked into our position seconds away from starting and this boat tried to pass in front of us and got caught in our bowsprit and capsized it. A crew member drowned which was terrible. They were bad experiences. TP: I got bored with that kind of racing so I decided that I wanted to revolutionize yachting. 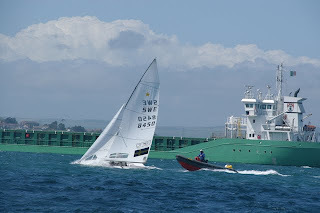 I always knew that the fastest boat downwind is a square rigger but they go upwind poorly and not fast at all. 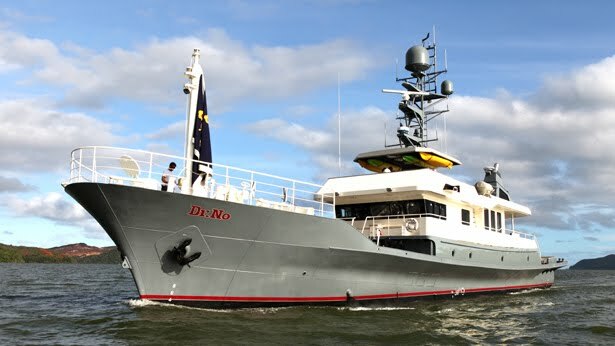 Perini had this hull - 88 meters - that the purchaser had canceled. I contacted Gerry Dijkstra to see what his thought would be about making a square rigger using that hull because it was so big. He proposed that it could be done and he proposed using the Dynarig, which I knew about wasn’t exactly sure of. I had a meeting with him and 3-4 hours later said, “Let’s do it”. Gerry later told me that when I left he said to the guys around the table, “Okay, so what do we do now?” It was such a revolutionary project. This was in 2000 and I didn’t actually purchase it until we had done some “toying tank tests” - models of that hull to see if it was going to be alright. It was sort of alright but it needed a deeper keel and I brought it further aft. It had a bulb in the front like a motor boat - all of that had to be changed. And, because I was adding so much more power to the rig because of the Dynarig, we had to add an extra 100 tons of lead, which meant we had to take out 100 tons of something else out of the design. So there was a bit of complexity there. TP: So here is a huge boat with a radical idea. No-one would bid on building this so I realized I was going to have to do it. Perini would supply the hull and the machinery inside the hull - generators, toilets, stuff like that - I would supply 100% of the masts, the sails, the controls and the electronics and since I’m going to do that I’m going to supply the interior also. I was the manager of the project because it was so complex. Perini just didn’t dare bid on it. But stepping back - before we started building anything, of course I had been in the VC business and the secret of that is to early illuminate the risk whatever it is in the deal, then pour in the money after you’ve gotten rid of the risk. So, I did two years of experimentation. We started with wind tunnel tests of the Dynarig at Southhampton University, England, in the famous wind tunnel there. The numbers were so good in terms of going upwind. We built a bigger model and did it again and it would go upwind as fast as a J-boat. It would go upwind about as fast as anything - except perhaps one of these America’s Cup boats (LOL - waves his hand toward the Bay) and it would just fly off the wind and downwind. It would be the fastest yacht in the world. The idea was to have the biggest sailboat in the world with the most sail area of any boat in the world and it be able to be sailed by only person by pushing some buttons and turning some knobs. That’s what we achieved. We won regattas with nobody on deck, just me inside the wheelhouse just pushing a few buttons and doing all the strategy and doing all the tactics in my head and controlling the boat at the same time. It was a total break through that I have to say, has worked beyond anyone’s wildest expectations. Two and a half years of experimentation with bigger and bigger models we finally built a full sized model of two yards and a sail - we built that in Turkey on the end of a concrete dock and the first time we tried it, it tore the sails to shreds. I spent weeks in a boson’s chair up that test rig inventing little widgets, most of which you don’t see because most of them are inside the mast - little guiding things and little gadgets - patented things most of which I have assigned to Perini because I want to see more of these built. I got it working so it would work anytime anyplace, any condition, wind from the right direction, wrong direction, snowstorm, too much wind, too little wind - it worked. So I knew if we could make one big full size sail work, we could make 15 of them work. So you’re sitting there thinking everything is fine because the boat isn’t healing much but the sails are being torn to shreds. On these big modern boats - the schooners and sloops - the sails are just being torn to shreds all the time. The boat ropes pull out, the clews of the genoas pull out, the winches are carrying up to 50 tons and you can be killed by a slack line. I’m a physicist and I knew this so I knew the way to build a giant boat was to go back in time, not forward in time, to the old clipper ships where you have lots of masts and lots of sails and of course you need lots of crew. That scales properly because you’ve got your course - your lower sail, your lower top sail, your top gallant and then your royal. As the wind increases, bit by bit you remove sail in small increments and you are always safe. So that’s what we did with the Falcon just by pushing a few buttons -the wind is blowing too hard, the boat is heeling it over 15 degrees which slows it down, you push three buttons. The top most sails disappear just by themselves, you don’t even have to look at them…little more wind, and so forth. I had the Falcon sailing in 50-60 knots of wind, no problem at all and sailing in 25 knots, it just loves it. TP: Are you kidding? I just loved the technology of it more than the hotel part of it. It was a very big boat with lots of cabins and lots of room for entertainment. I had all my friends on the boat many times, and then I decided I was spending all my time entertaining people although we did race it successfully. But it’s crazy - how can you race the world’s largest boat against boats that are only 80 feet long? We did several of the St Barts Buckets, which are a lot of fun but a little silly. I decided to sell the boat - fortunately at a profit - and move on. 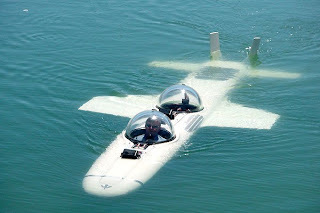 TP: The moving on involved the creation of a sub - it’s an underwater airplane. Graeme Hawk built it for me - when he built it he built two of everything so we each have one. It’s a true sub, not some sort of motorized scuba diving sub. You get in at atmospheric pressure and it stays at atmospheric pressure at all depths. We can go to 400 feet. I have another boat Dr No to carry the submarine and that’s what I’m really into now. It doesn’t have a sail on it or an inch of varnish - it’s a simple boat, it’s an adventure boat, it can go anywhere. It’s 135 feet. It’s practical and I don’t think unattractive. We were just filming whales in Tonga - Tony Wu, former Wall Street investment banker who is now devoting his life to the study of whales came with us. He helped us find the whales and also introduced us to whale psychology - what to do and what not to do. Dr No is now in Tahiti and I’m going to spend most of next year just enjoying it - it’s an incredibly beautiful place and I love to scuba dive which I still do at my incredibly vast age. TP: I’m not a naturalist although I’m vehemently opposed to shark finning. Nature has two great enemies right now - the Chinese who eat shark fin soup and causing the death of so many of these sharks, and the Norwegians and Japanese who kill whales. It’s almost cannibalism. TP: I’m very supportive of the America’s Cup - I’m on the America’s Cup Organizing Committee and have been invited repeatedly to go out on the AC45s. But I just feel I’m not nimble enough and I don’t want to be in the way! 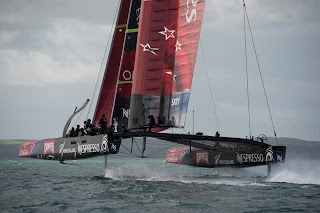 I love the technology of the America’s Cup. I certainly don’t think we should go back to mono hulls, not at all. I think these things are fantastic. I’m really looking forward to it. I did everything I could to try to get it here. TP: I have two 14 foot cat boats on Dr. No. They’re beautiful, built in Cape Cod, identical, close to a Hereshoff design. I try to sail everyday when I’m on board and just go out by myself. Now that I have two I can race them - I love to sail but am no longer into the big crew and all that. There’s a lot of ego in it all, although there’s no question that building the world’s largest sail boat was an ego trip! I wont deny it, but 1) I can do it, and 2) I made a contribution by single-handedly revolutionizing big boat sailing. There will be more. There’s a contract that’s been signed using the Dyna rig - it’ll be heavier than the Falcon and wont be as fast. Unfortunately the concept only works on big boats, it doesn’t scale down as well as it scales up - big boats being 50 meters and up and you don’t have to have three masts, you could do it with 2. There’s a beautiful design from Perini for a 70 meter 2 masted Dyna rig using my ideas and my patent. Nobody’s bought it yet but it will be a wonderful boat. TP: It gets better and better, there are more and more sailors. The only negative I have is the trend towards these giant boats that aren’t sailed by their owners. That’s hardly a problem. TP: I lost my wife to Lymphoma. I didn’t know about the event until about six years ago. I went to the event and they asked me to speak the following year, which I did - I spoke about the Maltese Falcon, which had just been finished and we were just beginning to sail it seriously. I brought the Falcon here the following year to raise money for the Leukemia Cup, which we did. I’ve been involved ever since and am the Honorary Chairman. I don’t sail the event - I’m 80 years old and while the noodle is still working I’m just not as agile as you need to be if you’re serious about racing. When I’m on a boat I want to win, and unless I’m the helmsman I’m a crew member and I’m not agile enough to get around the boat these days. 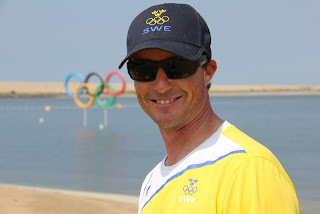 35-year old Mark Ivey found himself in a more curious sailing role this year - coaching the Swedish Star team of Freddy Loof and partner Max Salminen. Curious because it was Loof’s sixth Olympic campaign and Salminen's first, and because the relationship wasn’t initially intended to be a full-time coaching situation but more to help to Freddy evaluate how to get his program back on track. SB: How did you connect with Freddy? Freddy and I first met in 2004 at the US Star Olympic Trials in Miami. We became friends and really connected in California working for Pegasus and Phillipe Kahn in 2005-06. We raced a Melges 24 Worlds and an Etchells Worlds together, and did a lot of sailing out of Santa Cruz and the Bay. We stayed in touch throughout the Star events when I was working for the US as a Star coach. 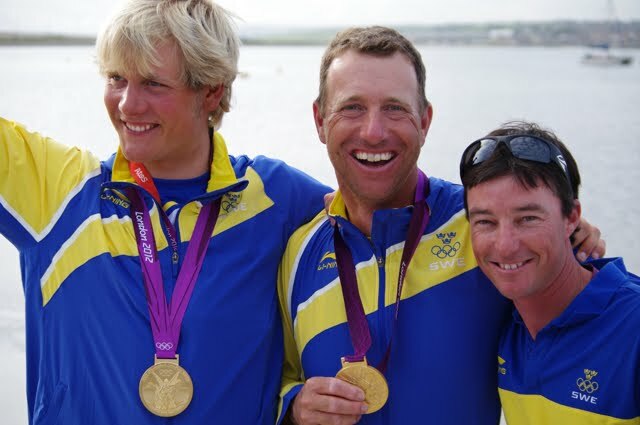 After the pre-Olympic regattas in Weymouth (August 2011), Freddy called me and said he thought he needed to make a coaching change and would I be interested in helping him out. At first I thought it would be more of a come-and-evaluate-life scenario, helping him get the right focus and getting him set up for the campaign. We really get along super well - we’re good mates. It evolved from there and the next thing I knew, I was there with him at every event. SB: What was not going right for Freddy that you were able to correct? I think he wanted an outside perspective - someone not directly involved with what he had been doing. Rather than the mechanics or the tuning side of it - I have all that in my skill set but it’s not what he needed - we worked on regatta management and the tactical side of it, performance at events. I tried to help him get back to the passion and enjoyment of it. It often turns into such a business and it’s a grind when you’re going through the same thing repeatedly. We’d had fun when we sailed together previously and I think he respected my tactics and the fact that I was still actively racing. SB: What were the Swedes' medal chances? Freddy became ranked number one during our time together after the seven events that I coached. He had two previous medals and this was his 6th Olympics (he won bronze in the Finn at Sydney, and bronze in the Star at Beijing), he’s not a stranger to the Olympics and being in that position. The whole design of everything we did was to peak at the Games and not at any of the previous events. It was almost to our advantage that we hadn’t won a big event leading up to it, the media hype and attention was more focused on Robert Scheidt and Iain Percy (Scheidt had won the past two world championships and Percy was obviously the home town British favorite). I had to believe they had every potential to win and for sure those two teams really stepped up huge, but it helped us stay under the radar. All three teams had secured medals going into the medal race and you’re in the best, deepest, most talented fleet in Olympic sailing so the fact that those three had beaten everyone else to secure medals meant a lot. SB: What do you teach someone who is already at that level? That was the almost daunting task. Here I am 35 and asked by someone I totally respect in the industry to help him win a gold medal - LOL. You just become very observant, you figure out how they want to receive information and believe it or not mistakes still happen by guys who are the most talented out there. You can help pick up on trends and what you feel out on the racecourse - little things on their mechanics, teamwork and communication - who does what and how to divvy up the job. Max is 23, Freddy is 42 and I’m 35, so I was a good bridge between the age groups to combine the two of them. While Freddy and I had an established relationship and trust, it was almost a bigger mental challenge to get together with Max and earn his trust and respect - we didn’t know each other so I had to win him over, then we had a great chemistry between the three of us. SB: What training regimen did you recommend? It varied - for the Olympic period the training was a lot of sailing on the outside courses where we knew we would be in the wind and the waves. We probably spent more time than most out in the hard, nasty rain and cold and actually made that into a strength. Most people complained about it, but we got into it and turned that into a positive. It wasn’t enjoyable at times but when the time came we were ready for the nasty stuff. There were lots of training camps and our training partner was Robert Scheidt and Bruno Prada, so that was a really strong camp, we also had the French team - Xavier Rohert and Alexis-Pierre Ponsot. Percy and Richard Clark and others had their own camp - that’s just how the Olympics works. On a typical day we would do a morning meeting then go out and train hard on the water. At the beginning we worked a lot on the tactical but toward the end it was really just my support. They knew what the needed to work on so my input was much more service rather than teaching. SB: Had Freddy sailed with Max together prior? They started two years ago so they’d done a full year before I joined them. Max had some Finn sailing - he’s in incredible shape, young and active and gave it his everything. Certainly for him to figure out how to present information to Freddy at the right times, he had all the mechanics - that part of it just came because we did so much repetition and so much sailing so it was more of the racing strategy - how to present the stuff at the right times inside the boat at critical race decision moments. SB: What was it that they did particularly well to win gold? The format for the Olympics is that you have to get through all the fleet races with everyone to be in a position to go into the medal race and be close enough to do it. The strength was sailing a good enough event to be in position to take advantage of the format which is a double points race at the very end. The medal race had not been a strength - it had been a monkey on Freddy’s back - the medal race in Beijing went all wrong for him where they finished last and dropped to the bronze. We wanted to keep a really calm pace that morning of the medal race (Ed’s note: you can hear the tension in Ivy’s voice as he re-lives this), and the same routines that we had done in meetings, I’d gone through all the mathematical scenarios and just kept it light. We didn’t have the pressure on us this time as the focus was on Percy winning a gold medal and all he needed to do was to beat Scheidt so that was a more of an individual battle - it just worked out that Percy was a little sidetracked on focusing on Scheidt in the middle of the group. On another day that may not have happened but that day it all just came together - that’s the Olympics. SB: What did you learn from the experience? The best part was being involved with a completely different side of it, working within a different federation, experiencing the Olympics as an American but through Swedish eyes. The passion of the closing ceremony was one of the most energetic and coolest moments of my life, to be there and walk through the stadium and see how much the athletes pour into the moment there, in every competition, watching them in the dining halls, seeing the Chinese people jump up and scream when they win a swimming gold medal - there’s something about being on the inside as an athlete and a coach - I have just a huge respect for everything that they do to make the event happen. SB: What’s next for you? More coaching? This was my first time as an Olympic coach - I was a training partner for JJ Isler and PC Glaser at the Sydney Games where they won silver medal. But this is the first time I was credentialed and got to be inside the Village. I lived in the Swedish team house in the Village - it’s taken a while to get back to normal here - it was just such an amazing experience. It’s been fun to be working the America’s Cup events lately - I’ve done five now - and will continue to see what opportunities are there with the 72s. I’m going to enjoy the fall and take a bit of a break. 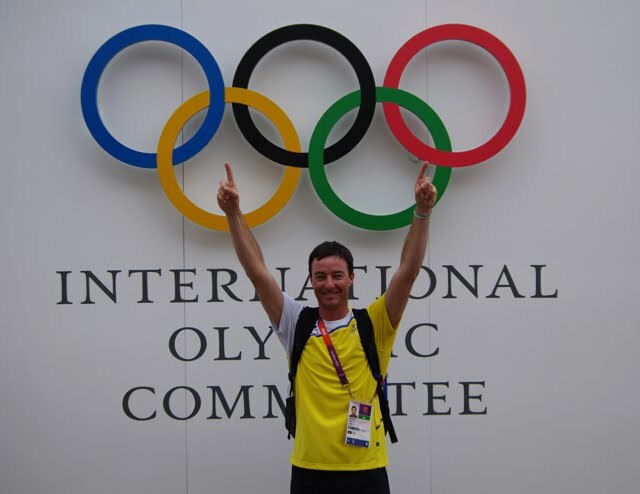 I’m not actively looking to be involved in Rio. The thing that made it great with Freddy was the people involved. It has to be the right thing. I really want to enjoy it like I did. 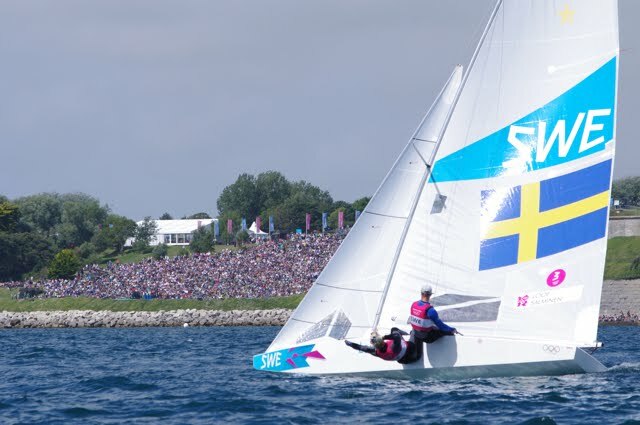 SB: What do you think US Olypmpic sailing could focus on? From where they were say eight years ago, funding levels have gone up, the ability for sailors just to focus on sailing and not to have to do a lot of private fund raising and not have to have a job at the same time - sailors are getting to sail more and compete more which is going to lead to better results and more training. I think there was a good focus on nutrition, health and fitness which is positive, in general there’s a bit more team chemistry. They did really try to make an effort with that. It’s America and we’re resilient and we’re always going to evaluate and move forward and have a better game plan for Rio - it’ll be different equipment, different personnel and people so it’ll be a whole new equation going forward. If US Sailing can bring back some of the respect - I think being an Olympian is one of the highest achievements that you can have in your career and I think they need to continue to harness that and bring some of the energy and passion back into it from past successful Olympians. If they can achieve that they’ll get the fire going again. 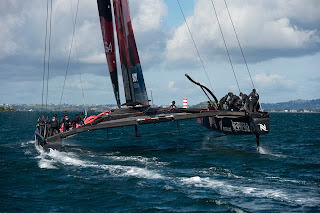 For the four syndicates still committed to putting an AC72 on the line for the 34th America’s Cup, it’s a busy time. While the primary focus shifts to the 72-footer which each team has launched or will launch shortly, the America’s Cup World Series rolls on, with another event in San Francisco starting today. While each team’s learning curve in the one-design 45-footers has plateaued, there’s a lot that can be learned about what it’s like to race high-speed catamarans on such a windy, and tidal racecourse. In advance of this America’s Cup World Series stop, Sailing World checked in with the skippers of three of the Big Four teams. 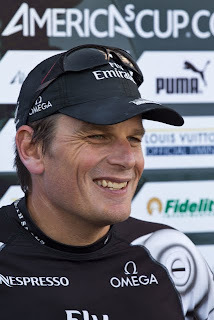 Michelle Slade chatted with Emirates Team New Zealand’s Dean Barker. Sailing World: Looking back to August, how was that event for you? Dean Barker: To be honest it was a disappointment. We came here definitely flat—we’d been putting so much effort into our 72 back home with its launching, etc., that we hadn’t really focused on the 45 or prepared well enough for that event. It was really quite a disappointment for us not to have sailed better than we did [7th out of 11 in the Fleet Racing and losing to Oracle USA Spithill in the semis of the match racing]. We had moments where we sailed well but we made a lot of mistakes. Back home we addressed some of the little details, but we know we can do better and look forward to a better performance this week. SW: It seemed that the starts were eluding you? DB: We did have a couple of bad starts initially, and that made it difficult. From there on we did a much better job, but we just couldn’t finish it off like we have been able to do in the past. We came away knowing we needed to better understand the Bay and the conditions, so we’ve asked Dee Smith to come in and give us some advice on local conditions. He’s been a huge help as he knows the place really well. Our speed was off the pace, so we’ve been working really hard to improve that. If you feel at all compromised, you pay for it all the way around the racecourse. It’s all about getting out in front and being able to stay there. We made a lot of tactical mistakes which we’ve addressed. SW: Glenn Ashby (trimmer) is off the boat with an injury? Who will replace him this week? DB: Yes, that’s unfortunate, and it means another crew change. Adam Beashel is here to replace Glenn and we’re working hard to get him slotted into the crew and our program. Adam’s a fantastic sailor and will do a really good job with what needs to be done. We’ll be fine by the time racing starts on Wednesday. SW: You mentioned in your blog that you had a fantastic day—probably the best here in San Francisco—last weekend? What made it so good? DB: The conditions are quite different to when we were here in August; they feel like they ratcheted down a notch. The Bay was just beautiful and Monday was stunning again with nice weather and warm! SW: Are you feeling pretty confident with your ’72? DB: We are really happy with our boat. It’s doing everything we hoped and expected it would. But, in saying that, in past experience with America’s Cup boats [usually quite serious, Barker laughs somewhat uncharacteristically], no matter how well prepared or how fast you are, until you line up against another team, you just don’t know. We have a lot of work to do before we can even contemplate being ready for the Louis Vuitton Cup let alone or, if things go well, the America’s Cup. But after nine days of sailing it, if that’s any clue, it’s performing well, it’s been reliable but there’s lot of things we want to improve to be ready to race. SW: How does it feel to helm versus the 45? DB: It’s completely different. In some ways the 72 almost feels more docile just because it is so big. The whole concept is generating a lot of lift with the foils, it’s really powerful, the apparent wind is always well forward; it’s just a different experience. SW: Are you finding it manageable? DB: Yep. We’ve sailed up to 25-26 knots of wind speed, and it was good; the boat behaved well. But, you just can’t afford to have an issue with these boats. If you have an issue they’ll be very frightening so you have got to be prepared to manage it very well and do things the best you can. It’ll be interesting that’s for sure. SW: How many practice days are permitted on the 72? DB: 30 days between launch and February 1, then beyond that, unlimited days through to the start of the Louis Vuitton. You have to really make use of each day. SW: How are the practice days observed? DB: You have to declare any day that you sail. There is a rule in place that if you are towed day to sail and decide its not worthwhile sailing, providing you don’t drop the towline, it’s not counted as a day. It’s fair to say I don’t think any team would go sailing without a bunch of spectators following them around so it’s almost self-enforced. SW: How do you think limited training days has worked? DB: Again, in some ways it’s almost been self-fulfilling. We were hoping to get in the water in mid-July and didn’t get in the water until end of July. Oracle obviously was late getting in the water and had a bit of damage, likewise with Artemis. On the whole, they are very difficult boats to get in the water, launched, and kept in one piece, so if you launched first of July and sailed through to February 1, even if you could get sixty days of sailing in, that would be phenomenal. It is just a challenge to get these boats on the water day in and day out. SW: You’re obviously not happy with the news that transpired last night concerning provisions that were promised to the Teams for establishing a base at Piers 30-32? DB: Other than what I was told last night, I wasn’t at the meeting so I can’t say too much beyond the shock of what we had planned for and now what we now have to deal with. We operate on a very tight budget that was based on not having to create our own facility. Now having to do that at a very late stage of the program is going to have implications. SW: Does Emirates get involved in these situations? DB: We operate as a stand-alone entity so whatever we do as part of the team is entirely up to us; the sponsors don’t have any involvement in decision-making - that is done by Team management. SW: The concept of ‘pit row’ has been so successful - it’ll be unfortunate not to see that now in San Francisco? DB: Yeah it is. One of the successes that we saw in Valencia was having all the teams together; it creates an atmosphere and adds to the environment. I’m trying to think of when it wasn’t like that, probably 1995 in San Diego when the boats were not in the same area as each other. Auckland was the start of the idea and it was a huge success. It was looking like it was going to be great here too, although there are not many teams. To have had them all together would have been brilliant, but now to be told we’re on our own is disappointing. SW: How do these off-the-water issues affect the sailing team in terms of morale? DB: We try to focus on the stuff that we can’t control. Anything that’s event related, we’re effectively just a passenger and one of four teams competing so we have to conform to the rules and regulations. The things we can control are our performance and the way we sail.